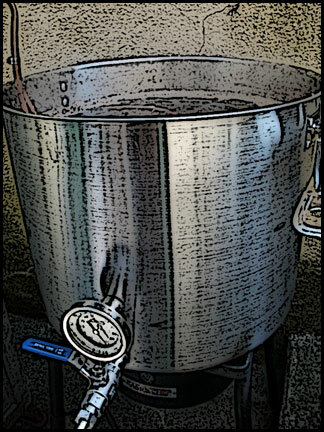 Yesterday, 07.02.10, was the perfect day to brew some beer! Yesterday I was able to take the day off from work extending the already long three day July 4th weekend into a four day weekend. My plans had changed twice already, but in the end I was able to revert back to the original plans, which were to brew a batch of beer. This time around it was an American Brown Ale. I have brewed this recipe twice before, once with Garrett and once alone. Each time there were slight tweaks to the recipe based on available inventory, but this third batch was almost identical to the original with Garrett. The brew day got started between 10:30 and 11 and wrapped around 6-ish or so. My friend Heather was able to join me for most of the day, in particularly during the more interesting first couple hours, and my other friend Robert was able to sit in for an hour or so in the middle, so it was nice to have company on a beautiful July afternoon – 83′, sunny, and low humidity – that’s my kind of day! There were no major cliches during the brew day, so that was good. I suppose I had a minor brain fart in the beginning because I swore I had ordered a particular base malt (Marris Otter) for this batch, yet couldn’t find it anywhere, only to realize that I had ordered it, yet used it on the last batch with the California Red, doh! Really not a big deal, I did have other English two-row base malt (Crisp) so I just made a substitution on the fly. Other than that I hit my mash in and mash out temps on the nose, there was no major waiting for water to heat, and no major mishaps with the boil. Though my original gravity was much higher than anticipated, actually my last couple batched have been … it may be time for a new hydrometer, this one may no longer be accurate. But then there was the cooling … Oh summer-time cooling, oh how I hate thee. An hour and a half later and the beer is only down to 80′. Don’t get me wrong, I know it’s because the ground water is so warm, but there are things I could do to help this be more efficient. For example, I am still using the same immersion wort chiller that I used for five gallon batches as I do now for ten gallon batches, I believe it is a 25ft 3/8″ unit, I should really be using something closer to a 50ft 1/2″ unit if I choose to continue to use an immersion chiller. Additionally I could add a pump to the system and pump ice-water from a cooler through the unit which would totally increase the efficiency OR I could upgrade to a counter-flow chiller or even better a plate chiller and really cut down the time. The current desired end chiller would probably be a Blichmann Engineering Therminator plus a March Pump plus a cooler of ice water. The thought would be to run the wort through the plate chiller while ice water passed in the opposite direction essentially cooling the wort as quickly as possible. And to avoid acquiring the cold break material in the fermenter, I think if the cooled wort was pumped back into the brew kettle again before being put into the carboy the false bottom/whole hops would help filter that material out, thus chilling ultra quick and still retaining clear wort. I bet I could easily shave an hour off my brew day. When the money tree blooms, you know what I’ll be buying. This entry was posted on Saturday, July 3rd, 2010 at 11:28 am	and is filed under Homebrew. You can follow any responses to this entry through the RSS 2.0 feed. You can leave a response, or trackback from your own site.